April Kennedy...My Life + My Style: GIRLFRIENDS...WHO NEEDS THEM! For awhile play dates and girl's nights out were very difficult for me. I found myself spending time with other mom's and trying desperately to get out of where ever I was with them before I burst into tears. I remember one vividly. I was invited to a play date that was at my neighbor's house. I couldn't believe that although I was surrounded by other mothers and young children, I felt so incredibly alone. This was how I felt often in these situations. Because Blake 'looked' so normal and somehow I was able to manage smiles and light-hearted conversation, everyone just thought casually of our 'situation' and that Blake would just 'get better.' It was so hard for me to answer the question, "but he will get better...right...I mean he looks so good?" It was then that I wanted to scream..."what part of permanently disabling" did you not understand. It was about that time that I would thank the person for the invite and excuse myself as quickly as I could. The first few years of Blake's life Dave and I hid our emotion from most people. The worst thing you can say to someone with a child born with a disability is "Well, God gave him to you because he knew you were strong enough to handle it." That might be all well and true, and actually I do believe that statement, but when a mother and father are trying to cope with all the newness of a baby and then add all the special needs on top of it, the last thing they need to hear is that they are suppose to be strong. It made us feel that we were always to be strong and to show weakness was not part of the plan. There were so many times I sat with other women and wanted to really share what was on my mind...I wanted a healthy normal baby so bad, my heart was breaking behind my smile, I had nothing in common with these mommies, they had no idea how easy they had it and how difficult our schedule was at our home. I felt so alone, so heartbroken, so mad, so vulnerable, and most times wanted to just cry and show my weakness and let everyone know that we were NOT strong right now and that THIS was difficult. Difficult to adjust to hourly needs, difficult to adjust to 20 minute diaper changes sometimes every hour, difficult to comprehend what the future would hold, difficult to grasp what long term effects he would have with his body, would he walk as an adult...probably not, would he be able to have children...probably not without help, would he be teased by children in elementary school for still being in diapers....probably, and would HE be strong enough to be OK with who he was. I found as I turned inward to deal with our little blessing that I was left with NO girlfriends. I felt like I didn't need anyone but Dave in my life during that time and my sister Jill, who would offer mommy support when she herself wasn't in need of it! (She had 4 young ones then.) In time, as Blake got older, I had pretty much come to terms with what 'normal' was going to be for our family and I was feeling happy most of the time again. 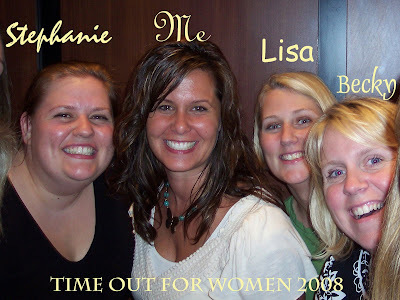 I was invited to be a leader at our Young Women's Girls Camp for a week in the summer and also invited to Time Out for Women for a weekend get away when Blake was 3 and 4 years old respectively. These events were 'girl only' events and were life changing for me. I found out how important it was to have girlfriends again. Girlfriends that, as mothers, would be able to comfort me, make me laugh, listen to my fears and share my heartbreak. They also shared fears, laughter and heartbreaks themselves as mothers, whether to healthy children or not. I am so happy to say that I have girlfriends now and I NEED them in my life. I have always needed them. And I feel so comfortable with them. I am so glad that my sister is my friend. I spent Friday night scrapbooking with a group of girlfriends. We had so much fun. 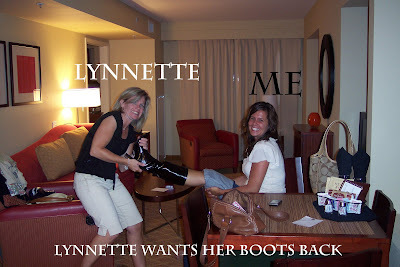 We laughed, we vented, we shared pictures and stories and we decided which Desperate Housewife each of us were most like (even though I don't really agree with them on their choice for me...I'm way more a cross between Gabby and Lynette...especially after last week's episode. They had me pegged as Susan, which I can partially see, especially with this discussion I am having right now trying to non-validate it...although I can stay married a lot longer than her...anyways). We stayed up until 1:00am that night and it was great. I love my friends here in Napa, I love my bloggy friends, I love my BB chat friends, and my friends who I no longer live near. So...who needs girlfriends? I DO and I love each one of you. Here are a few of you! It's my Thursday, which if you remember from a previous post, is heavenly for me. Today I am going to breakfast with a girlfriend. Lucky me! what a sweet post. thanks april!! Hello April I have no idea how I got to your blog today but well....here I am all the way down at the bottom of the world in Australia writing a note to a lady I never knew was out there until about 5 mins ago. Your post touched this nanni's heart, your strength (yes strength) to show us all what life is like, how to feel, how to cry and how to just go for that want in your life........friends. I know by that smile I see you have come full circle and while life still is out there to deal with everyday your friends are a special part of that day too. I take a little from your post too and will add it to my life, for that I am most greatful. Like a bird I spread my wings today and send you hugs dear lady. Geuss what I have a blog! And I am so glad that you need us! So fun to see Becky and Lynnette and you of course. Give them my love! Great post. ok I am crying. I just need to say I love you. Girlfriends and family are the best. Even though we don't talk much I feel so close to you. We really need to get together again. April this was so special to all of us, for you to share such a special part of yourself. As for me, I miss you, have been through *hopefully* some of my hardest times, and am so grateful to have had you as a visting teacher and friend. Thanks for the great story! I too had a few years of inward isolation. I felt like an alien of sorts. I found that once I opened up and let my loved ones know that I felt just as much pain and sorrow as the joy and pride, I began to regain my balance. It's still so hard at times to be amongst others that simply can not, nor should be expected to, relate to our life. But then there are the times that I feel like I'm the most blessed person on the face of the earth. Sometimes the spectrum of feelings is overwhelming. I'm sorry we've been out of touch, but I think of you and your family often and hope your blessed days outnumber those that present challenges.